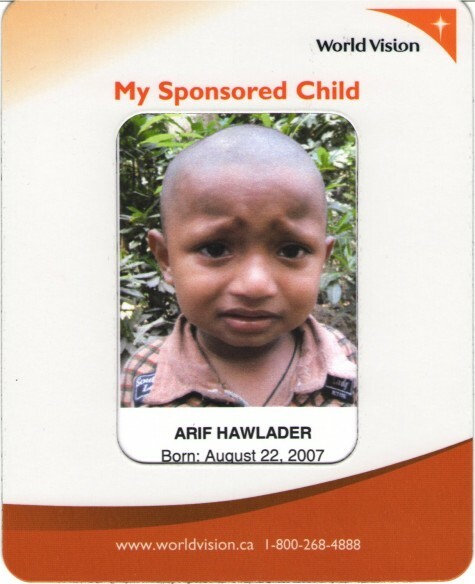 I am a proud sponsor of Arif Hawlader through the World Vision program. He’s a three year old boy from Bangladesh. I didn’t watch any program on TV or the sort, I was simply doing laundry when a canvasser knocked on my door. A young man of nineteen started giving his pitch on the program. I interrupted him with my spiel about how the economy hasn’t been lending me much of a helping hand lately. Well, you can guess who won that pitch-off. But that’s okay. Really, the monetary commitment is a small fraction of what I waste on a daily basis. About a cup of coffee is all it costs to sponsor a child. So, I’m brewing coffee at the office instead of the daily swipe of my Starbucks coffee card. That’s not all! I also pack my own lunch every day. And for many reasons: 1) I finish my groceries rather than throwing them out at the end of every week; 2) I save time eating at my desk instead of running downstairs and standing in line; and of course, 3) I save even more money from not buying lunch. Sometimes, I don’t even eat lunch. Saves time, money, and my waistline. But most importantly, I feel good about myself for losing to that nineteen year old canvasser. I think we make too many excuses not to burden ourselves with the numerous charities we come across regularly. I know for the most part I have used the line: “I don’t have the time right now” to many street canvassers on behalf of organizations like the Red Cross and many others standing at various corners of the downtown core. Mainly because I tell myself that they will be there again tomorrow, in which I will then have the time to listen to their story. That said, I do sporadically contribute to various charities, such as the Children’s Hospitals and other hospitals. But I know that there are many of my peers who have never had that crossed their minds. I’m not accusing them of being insensitive and uncaring people. I think it is because we don’t talk or “tweet” about these things as we should. Instead, we brag too much about all the fabulous things we bought for ourselves (such as my new 40″ LED HDTV) or about all the fabulous places we’ve traveled to and so on. Of course there are many who give generously and don’t even think to mention about it. I think they should. Not to brag about what wonderful and compassionate people they are (and I’m sure that is not the motive), but to remind others that there are more things to talk about, tweet, or update than just about the great, privileged lives we have. Lastly, contributing your time to volunteer is equivalent or even more valuable than just making a monetary donation. I have been volunteering some of my time to fund raising and it’s not that bad. I actually enjoy saving the money by lending my time instead. The key is to just put your name on the list and show up.